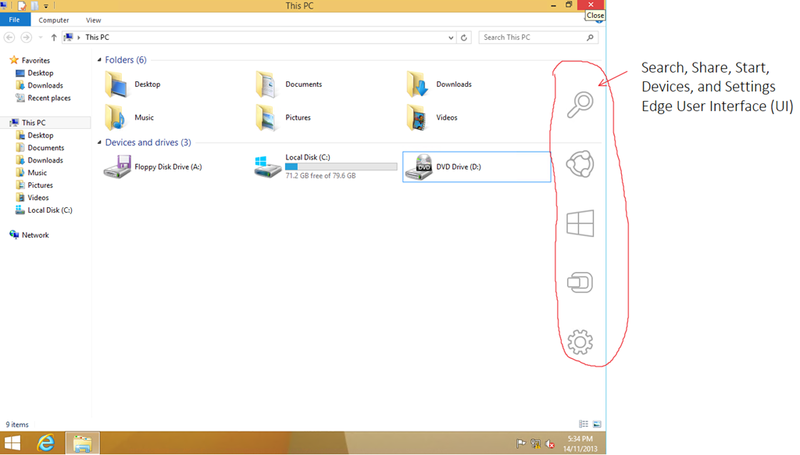 Whenever a new user login to Windows 8.1, they will get help tips on Charms as shown on below screen capture. It will go away till user perform once as instructed. This can really be irritating to experienced users. 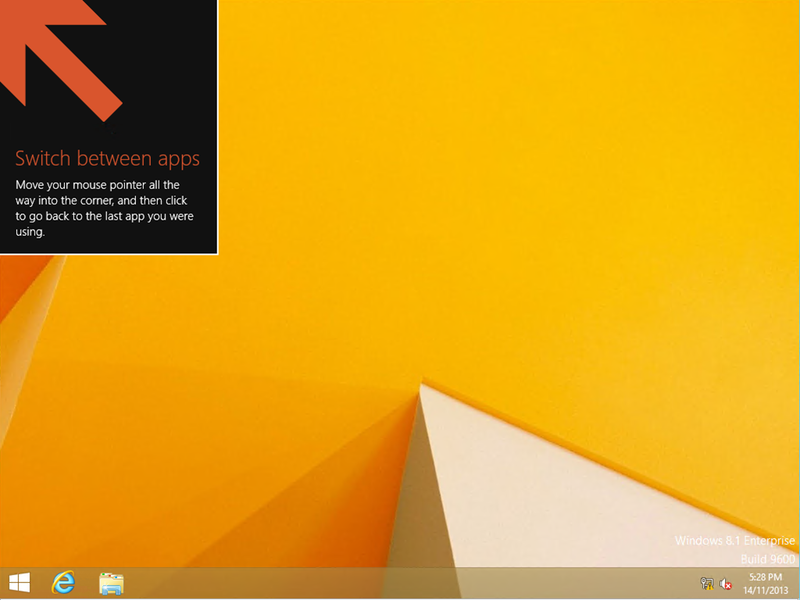 But it can be useful for those new users to Windows 8. Note: As of now, I will retain the setting as “Not Configured” as most users in my environment are still new to Windows 8. But after one year later when most people would have been familiar with Windows 8 when they upgraded their home machine, I will set this setting to “Enabled” before users come after me! Cheers! 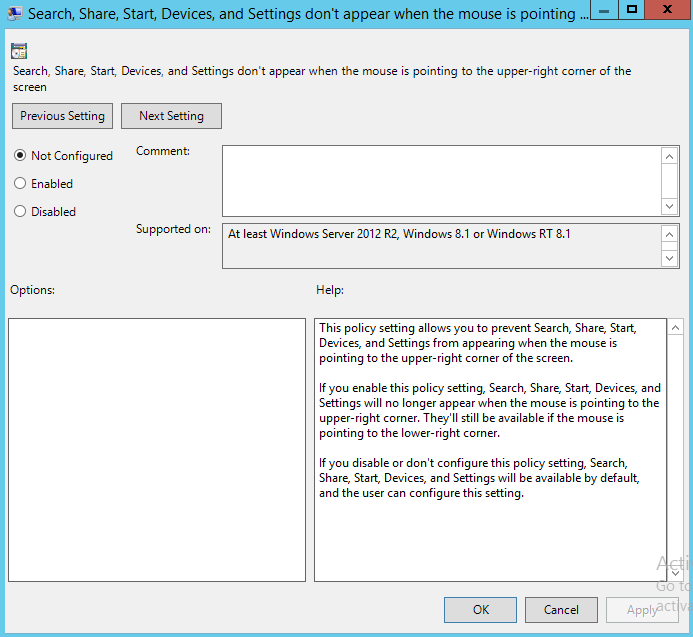 Does your user complains to you that the Search, Share, Start, Devices and Settings Edge User Interface (UI) keep appearing every time they try to close a Windows Explorer or Application Windows? 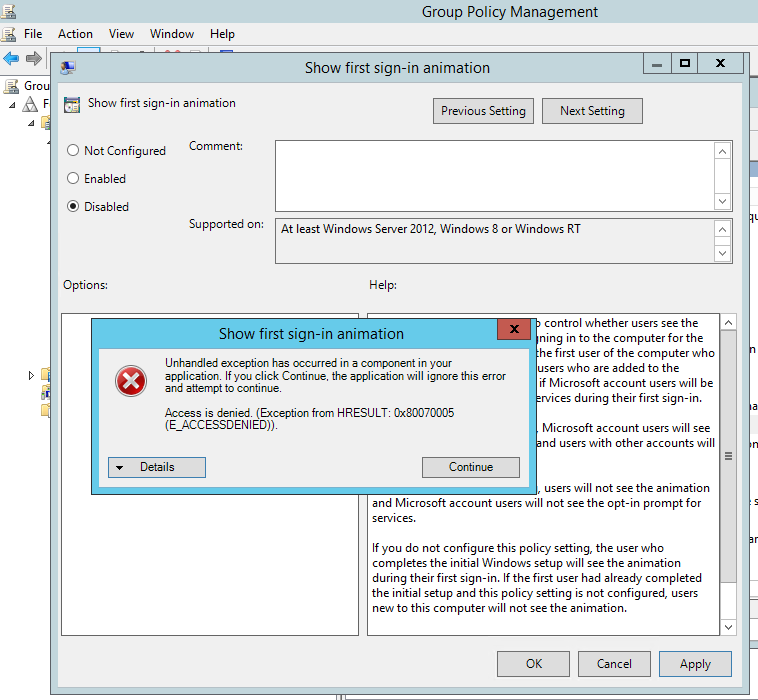 Note: This is user configuration policy so that you can target this setting to certain group of users in your environment. And PLEASE discuss with your bosses as many people may be used to move their mouse pointer to the upper-right corner of the screen? Hope this helps in your planning on deploying Windows 8.1 in your environment! In case you are thinking what are the following settings mean. I am sharing with you on what I have combed through for my usage to buy you some time… Hope you find it useful. Note: Cannot find in ADMX file. You may need to comb through the whole excel sheet together with test environment to get a full picture of what the settings are. Following are some that I went to sort out. Hope this will buy you some time. Ok… I am still going through the whole excel sheet. Most of the new settings are for Windows Defender that will make it very manageable. But my environment is using McAfee. Guess I can only play it in my test environment! 1. 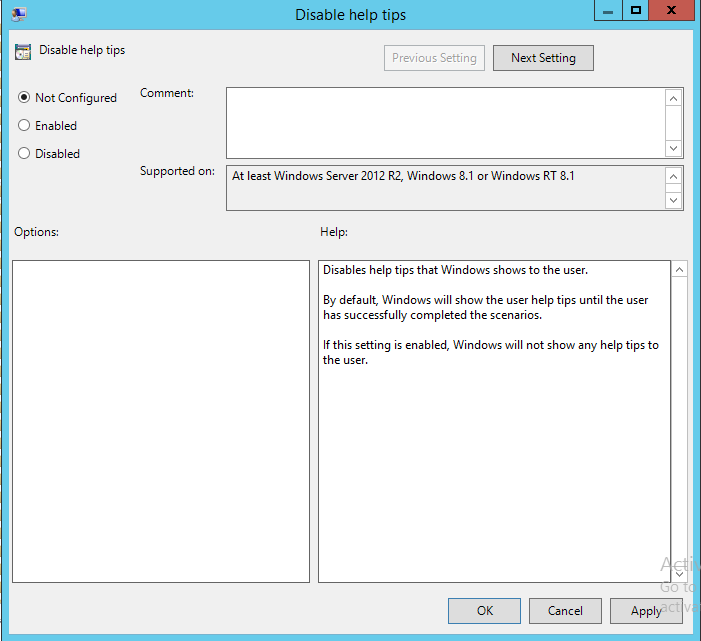 Setup a new test Windows Server 2012 R2 Test Domain in Microsoft Virtual Environment. 4. Create new GPOs and Import GPO setting directly from ISO. Anyone spotted the root cause? Hahaha… Actually, I encountered this problem before too. So, when you import… It took the whole setting over! How to revert? Locate the GPO’s unique ID. Go to the folder containing the GPO folder. Find the folder that is named after the GPO unique ID. 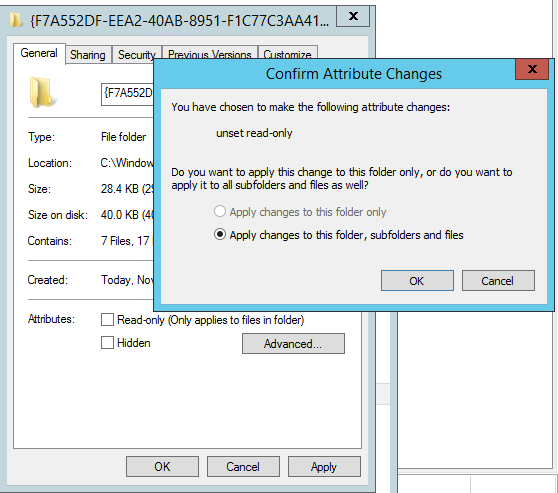 Under properties of the folder, uncheck “Read-Only” and select “Apply Changes to the folder.. subfolder and files”, and click OK. Note that after you apply, you may noticed that under the properties page, the check box is marked “Read-Only”. Do not panic, just go and try to edit the GPO now. It should work. The solution here is target for single GPO issue. If you cannot edit ALL GPOs. The problem may lies with the permission of your SYSVOL. Which I suggest you to look else where for solution. 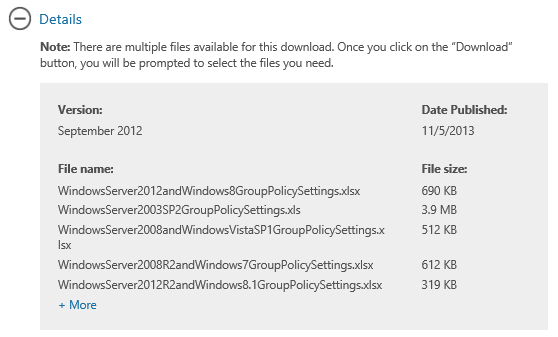 Group Policy Settings Reference for Windows 8.1 and Windows Server 2012 R2 is released! The wait is over… The spread sheet that GPO administrator will NEED is out. Please follow the link below to grab it now! What to do after you download? HAVE FUN! I am going through one by one again to make sure I do not leave out any of the settings! Remember to Update Your WMI Filter in GPOs! Recently, after I successfully deployed a GPO for Windows 8, another of my team-mate told me that 802.1x GPO does not work for Windows 8 machine. So, fun time – troubleshooting begins! All settings looks fine on the GPOs from GPMC. But I noticed something… the GPO containing the network setting for 802.1x has a WMI filter that targets ONLY Windows 7! So, what does that mean? That GPO will not be applied to the Windows 8 Client machine! Haha! The reason why it was there initially is to prevent people from joining Windows XP to domain and get the 802.1x settings. Never realised that it will have some impact now after 2 years. So, after I removed the WMI filter from the GPO, problem solved! 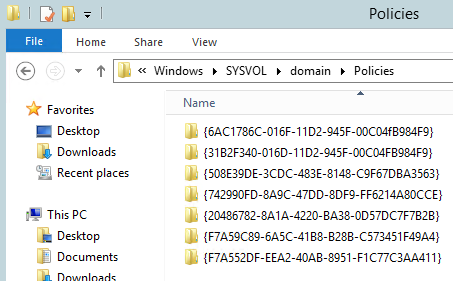 I actually take some time to comb through the whole domain for other GPOs that were applied with the Windows 7 WMI filter.